A few weeks ago, we told you guys about a Samsung promotion of sorts taking place on the manufacturer’s US Facebook page. They promo had customers with either the Samsung Galaxy S3 or Samsung Galaxy Note 2 register their devices with Samsung in exchange for a special care package. 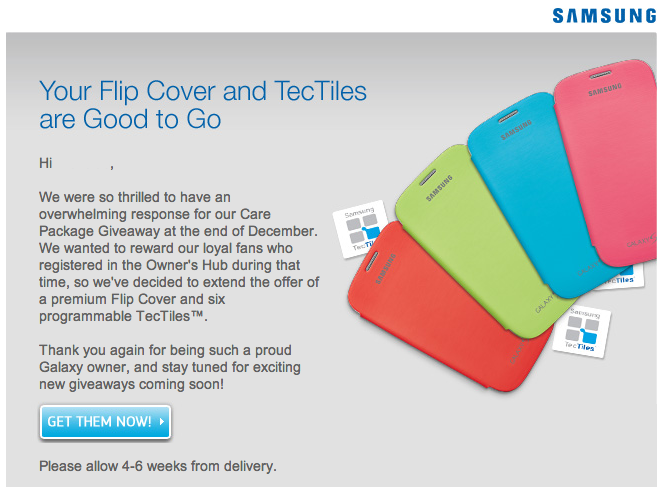 Inside, Samsung packed a free Flip Cover (a $40 value) in the color of your choice, as well as a handful of TecTiles to place about the home, office, or car. The promotion didn't last long, and many were left high and dry once word spread throughout the Internets. For those of you that did go through the trouble of registering, but weren’t quick enough to nab your free goodies, you might want to check your email inbox (or spam box). Looks like Good Guy Samsung is honoring their promotion yet again with a 2nd wave of care packages being sent out to already registered users. While we’re not sure if registering now will do you any good, it certainly can’t hurt, can it? For those that nabbed the deal the first time around, you should check your mail as we’ve been getting numerous reports of the first round of Flip Cover and TecTiles already landing on doorsteps.